Rep. Tess Taylor announcing her resignation from the Vermont House on Friday. The third-ranking Democrat in the Vermont House resigned her seat Friday to take a job with a new single-payer advocacy group. 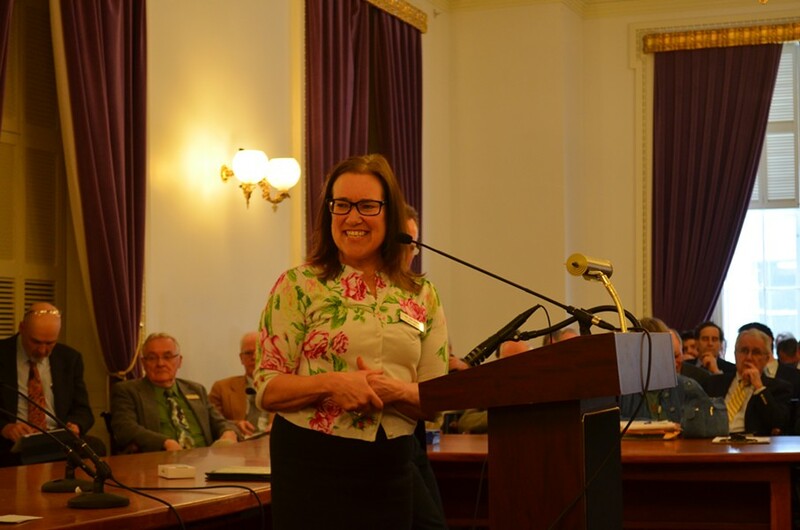 Rep. Tess Taylor (D-Barre), the majority whip, told her colleagues at a Statehouse meeting of the Democratic caucus that she had been hired Thursday as executive director of Vermont's CURE, a 501(c)4 founded in January to advocate for universal healthcare. House Democrats will hold an election Tuesday to fill her leadership post, and Gov. Peter Shumlin will appoint a replacement to her House seat. "As late as last night, people always say to me, 'Do you like what you're doing? Do you like being the whip? Do you like having to do all that work?' And I have to say, truly, I have loved it," Taylor told her colleagues. "I loved being your whip. It's just been an honor." The existence of Vermont's CURE was not widely known until Wednesday, when Vermont Public Radio first reported on it. On Thursday, KSE Partners lobbyist Todd Bailey disclosed that the group had received just one, $100,000 pledge, from the American Federation of Teachers. Bailey, a cofounder and consultant to the organization, said it plans to seek more funding from "individuals, foundations and other organizations." Taylor says she was first approached by Bailey and fellow KSE lobbyist Bob Sherman "a couple weeks ago" but wasn't formally offered the job until Thursday night, after Vermont's CURE's board met for the first time. "Once that offer was actually made, I felt that it was really incumbent upon me to step down, so there wouldn't be any conflict," she says. "Plus, it's going to be a really big job." Precisely what that job will entail remains unclear, Taylor says, though she maintains she does not plan to lobby her fellow lawmakers through the conclusion of the current legislative session. "We haven't talked any details yet," she says. "It's an executive director [position], so it's soup to nuts." Legislators have discussed several proposals this year to create new rules governing the employment of lawmakers and ex-lawmakers, though none of those proposals has been adopted. Taylor says she has no reservations about moving through Montpelier's revolving door and going to work for a union-funded special interest group founded by a Capital City lobbying firm. "My interest and passion as a lawmaker remain the same, whether I'm here or there," she says. "And there, it seems like I could be doing more." At his weekly news conference Friday, Shumlin said he had been briefed several weeks ago by Sherman on Vermont's CURE's plans. He said Sherman had not disclosed its source of funding. Taylor will join a crew of newly hired advocates for Shumlin's ambitious health care reform proposal. Last month, the governor tasked former House majority leader Floyd Nease with lobbying legislators on the issue. Also last month, health care advocate Peter Sterling left his job with the Vermont Campaign for Health Care Security to relaunch another union-funded, single-payer advocacy group: Vermont Leads. Darcie Johnston, a Republican operative and founder of Vermonters for Health Care Freedom said Friday, "Democratic dissent and weak polling combined with the vast resources flowing into Vermont trying to save this failing single-payer scheme will not be saved by adding a new captain to the Titanic."